In the fifth decade of Victoria’s reign, two paths brought together an indefatigable Anglo-Irishwoman of means, and an Englishman of mettle; on 2 August 1877 they married, honeymooning in Italy. The newly-weds, she 31, he 25, moved to live in London, a stone’s throw from Marble Arch, in a rented townhouse at 13 Great Cumberland Place, 4 and within a year or so the inseparable couple were off on a series of breathless, annual trips that were to continue until, 20 years later, on 5 May 1897, the Englishman, an ‘archaeological adventurer’, died from malarial complications, and Mabel Virginia Anna Bent found herself once more on a solitary path, left with her memories and an assemblage of travel Chronicles, in the form of modest, lined notebooks, that she ‘always wrote during [their] journeys’. After her death, formidable and 83, in 1929, these Chronicles in the form of two dozen small leather notebooks found their way into the archive of the Hellenic Society, out of the light and overlooked. These are the journey accounts of Mr and Mrs J. Theodore Bent. Sooner or later, any of today’s travellers who venture as far east as Karachi, south to Cape Town, west to Lisbon, north to Warsaw, will undoubtedly find themselves on a route once followed by the Bents. Before the invention of flight, these two were amongst the most-travelled and best-known husband -and-wife teams of their generation. Modern bibliographies that have to do with archaeology, anthropology, ethnography, botany, and other such fields in regions from Abyssinia to Zimbabwe, are still very likely to refer to the articles, papers and monographs of Bent, J. Theodore, and occasionally Bent, Mrs J. Theodore. In pursuit of their researches, their reputations increasing with each campaign, the Bents preferred to travel abroad during winter and spring, returning to London (and from there making shorter journeys to see friends and family around Ireland and the English countryside) over long, pleasant summers, when they would write up their findings, lecture, and plan next season’s adventure. Mabel’s Chronicles provided Theodore with much of the background material he was to use for his later monographs and articles. A look at his long list of publications brings into focus three concentric, geographical circles – the Eastern Mediterranean (Greece and Turkey), the greater continent of Africa, and the Near and Middle East. In 1889 the explorers interrupted their sequence of Greek and Turkish expeditions to visit Bahrain and Persia, the first in a nearly ten-year programme of visits to (mainly southern) Arabia, involving persistent attempts to travel deep into the Wadi Hadhramaut (Yemen), a region then almost entirely unknown to Europeans. Before turning in earnest to the Yemen, the Bents, encouraged by Cecil Rhodes, undertook in 1891 a lengthy journey to modern Zimbabwe, the success of which helped Theodore generate the support for his first, large-scale expedition to the Hadhramaut in 1894, and his subsequent returns to the region right up until his early death in 1897. This ‘Southern Arabia’ phase, and Theodore’s quest for ‘Phoenician’ and related associations across continents, were what motivated the couple for the rest of their travelling lives and provide the content for what follows here. Mabel was born in Ireland on 28 January 1847, the second of four daughters (she had eight siblings and numerous aunts and uncles. Tragically, a younger brother, Charles, accidentally shot himself, although suicide has been mentioned, near Worcester train station on the way to school, the year before Mabel married Theodore; she never refers to the incident). She was born to the wealthy landowner Robert Westley Hall-Dare (of Newtownbarry House, Co. Wexford) by his marriage to Frances, daughter of Mr Gustavus Lambart, of Beauparc, Co. Meath. Educated at home by governesses and masters, Mabel developed a sharp intellect, a gift for languages, practical skills (she was to become a pioneer travel photographer), and a thorough grounding in what might be called ‘common sense’. She was also a fearless horsewoman. Five feet eight inches tall, a green-eyed, sturdy redhead – striking in her photographs – her plaited hair was often the subject of native wonder. Outgoing and confident (she enjoyed ‘amateur dramatics’), she was as happy taking fences at full gallop in her native Wexford as she was dining with British ambassadors in Cairo or Constantinople. Her privileged background fostered an early enjoyment of travel; summers would see her on the Dublin ferry for Holyhead, heading for Europe or Scandinavia (she met Theodore in Norway somehow), touring with her brother Robert, his wife, and her sisters. The couple’s last journey together was to Socotra, near the Gulf of Aden, in March 1897. Theodore died on the fifth of May 1897, back in London, from pneumonia following on from malarial fever. Mabel, understandably, lost her desire to travel immediately after Theodore’s death and her last Chronicle (1898) is prefaced ‘A lonely useless journey’. After 1900 she began a series of visits to the Holy Land, during one of which she ventured alone into the wilderness around Jerusalem and somehow her horse fell on her, resulting in the above-mentioned injury to her leg. It was a mysterious episode that can be seen in the light of an increase in seemingly irrational behaviour that brought her into conflict with British diplomats and officials in Jerusalem and London. The promise displayed by Theodore, and the reputation which Mabel shared, after his apparent successes in Zimbabwe in 1892 was tarnished by his relative failures in penetrating the reaches of the Wadi Hadhramaut in the Yemen – failures that stemmed from a near obsession to identify links between the peoples of the wider region of the Red Sea in the first millennium BC. 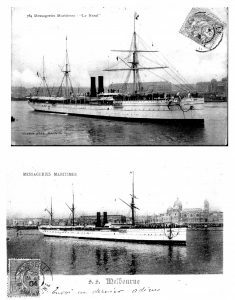 Had Theodore and Mabel in 1895 been able to reach the Hadhramaut from Dhofar, and proceed west to Aden, a feat never before recorded by a European, it would have been an achievement to match any subsequently undertaken in the region and one certain to have earned the explorer a coveted medal from the Royal Geographical Society. As it was, Theodore’s ambitions were dented and he was to find it harder to get support for further trips to the region. Mabel would have shared in her husband’s disappointment. This juncture marked the start of an even more difficult period for Mabel. The mixed reception of her best efforts to do justice to her husband’s later work, couched in what resembles an academic snobbishness (or jealousy even?) that was all to familiar to her, also alienation (her closest family were in Ireland), and a lack of focus fed by grief and a disturbing fundamentalism, all prompted her decision to undertake the series of trips to the Holy Land referred to above. During various stays in Jerusalem Mabel became involved in a minor scandal among the local diplomatic community, causing the considerable irritation with HMG officials alluded to above. Wondering alone around nearby Bethel, she may well have made a personal dedication to Theodore by ‘offering’ to him there the little clay stamp they had acquired in the Hadhramaut, and over which an academic controversy has developed since it was found, or found again, in the late 1950s. There appear to be little in the way of further records of Mabel’s travels after the mid 1900s. She based herself in the same rented home near Marble Arch that she had shared with Theodore; apparently she enjoyed entertaining her many nieces and nephews, feeding them quantities of nourishing artichoke soup. Around her were artefacts, souvenirs of their journeys together, the collection gradually reducing as she reached her final years and her family encouraged her to make donations to the British Museum – some of her items from the Yemen being the last to leave.